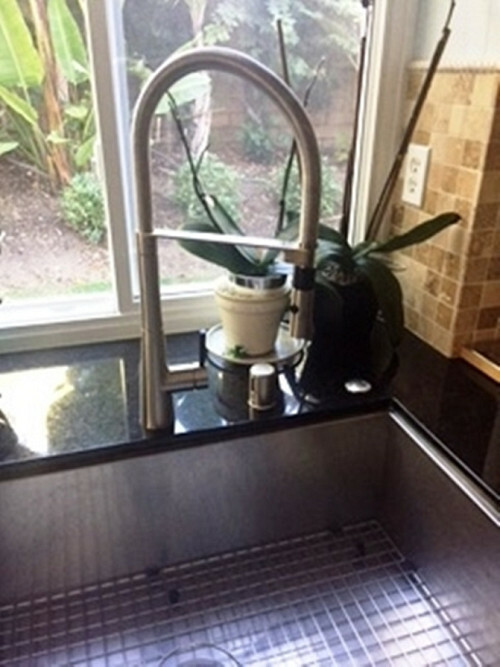 WHAT MY NETWORX CONTRACTOR DID FOR ME: Removed a damaged kitchen faucet and installed a replacement. WHY I CHOSE HIM: Careful attention to what the job involved, fair price. As the replacement, I purchased a Kraus faucet, because it’s made with a unique feature which no one else in the industry has. It’s a standard spray faucet, not a pullout, but it’s made with a special cartridge that allows you to install it completely from above the sink, without having to do any undersink work. Kraus calls it their Quick-Dock. 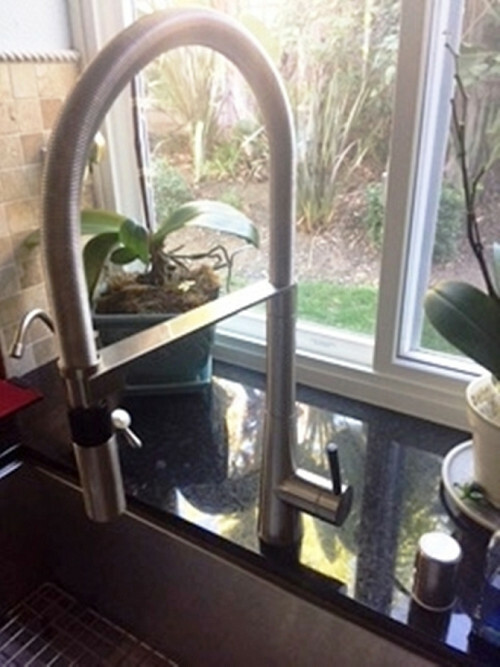 To install any other type of faucet, we would have had to remove our beautiful stainless steel farmhouse sink, which we did not want to do. I originally looked on Yelp for “plumbers in my area” to install it and had contacted two of them. However, the first gave me an exorbitantly high quote over the phone. The other came by, but never looked under the sink. He just pulled out his iPad and told me, “This is what we charge for a faucet replacement” … which was actually more than what I had paid for the faucet itself. I asked, “That’s not including the fixture?” and he said, “Yes, that’s our price.” They were unwilling to negotiate; they didn’t even want to hear why the faucet I had was different. So I went back to looking online and eventually got in touch with Stubbs Plumbing, who were intrigued by the new type of faucet. They took the time to come in and look at what it would take to remove the old faucet and install the new one, followed by what we thought was a very fair price for the labor involved. Although it was more than what I’d hoped to pay, it was still at least $100 less than what everybody else was quoting me. So we hired them. The total time for the job was about an hour and 15 minutes – an hour of that was removing the existing fixture; the 15 minutes was installing the new one. My advice to homeowners is to hire a contractor who is willing to look at what a job will actually involve and not just quote out of a book; someone who’s ready to listen. The plumber I hired was willing to learn. In fact, he told me that he’s going to go back to the wholesaler where they get a lot of their supplies and get them to start stocking that model, because its unique feature will make everybody’s life easier. Toilet Repair By A Plumber I Knew Was The Right One For Us by Bonnie G.
Air Conditioner Repair Fixes Sloppy Installation in a House Flip by Kevin M.
In 123-Degree Heat, Air Conditioning Replacement was a Must by John S.